hehe he looks really funny, also nice job on shading! i like how this is gibberish... I'm joking, dude... Great picture and keep up the good work!!! jake:"I'm on a boat with a couple of wackos, shaking my hips while I'm dipping my fat toe, IN THE WATAAAHH, IN THE WATAAAHH. 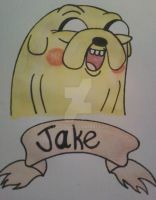 jejejejeje nice men el buenazo de jake !! i gues i have to see adventure time in all languages i can coss is amazing. Okay, wow, this is awesome.